So, you decided that your child will take music lessons, and now you must find a music teacher. How do you do that? Obviously, you want to find a teacher who is qualified, who will work well with your child, who will inspire your child to greatness, and will make every lesson as exciting as a favorite video game. Is there such a person? 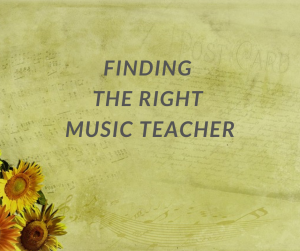 Probably not, but I am sure you can find a music teacher who is just right for your child! I managed to find at least 10 different music teachers for my children, so I am pretty sure you can find one too! Word of mouth is probably the best way to start looking for a music teacher. Ask your friends if they know anyone qualified. Does your child have any friends at school taking lessons on the same instrument? Ask them who their teacher is. Is there anyone at church who plays that instrument? Ask them if they know anyone who teaches that instrument. Ask the music teachers at your child’s school. They often know people in the area who teach lessons. See who they recommend. Also, ask at your local music store. Sometimes a music store has teachers who teach lessons there. Or they might have a list of private music teachers in the area. One of my girls took lessons for a while from a teacher at our store. Are there any universities, colleges, or community colleges in your area? Check with them. If the school has a good music program, there are probably students who would be happy to earn some extra money giving lessons. Also, some music departments have a “prep” school connected with them. This gives their music students an opportunity to give lessons in a supervised environment. Other colleges may have a community music program that offers lessons by qualified instructors to the general community. Three of my girls taught at their college music prep school. Three of my boys took lessons from the community music school at a local college. Search the internet – there are professional organizations that list music teachers by area. Sometimes music teachers have their own websites. Do some research. Okay, so you narrowed your search down to a couple names, now what? How do you proceed? What things do you need to consider before making a final choice? Does the teacher have openings in her schedule, or would your name go on a waiting list? Does the teacher have good references? Ask for some names you can contact as references. Do you think this person will be a good fit for your child? Will their personalities work well together? Can you (or your child) deal with the teacher’s expectations? I took my son to a trial lesson with a music teacher once, and I thought the teacher was just a bit too intense for my son. A few years later we came back to that same teacher, and my son had developed enough so that this teacher was just what he needed. They worked together for several years after that. Ask for a trial lesson before making a commitment. Sit in on the lesson. See how your child and the teacher interact. See if you are both comfortable with the teacher’s style. Also, be sure you understand how the teacher expects to be paid. Don’t settle for the first teacher you find, look for someone who will challenge and inspire your child. Look for someone who will care about their progress and who will motivate them. I hope you find a great music teacher! What other suggestions do you have? Leave them in the comments section. I look forward to hearing from you! Previous Previous post: Music Theory – What Is It and Why Should I Care?